One of my favorite things about writing for Magic Style Shop is keeping you in the know about Macy’s latest and greatest sales so you can maximize your shopping budget. But today I have a special secret: did you know you can choose your own Macy’s personal sale day? All you have to do is create a Macy’s profile to get an extra 20% off your next purchase. The beautiful thing about Macy’s is that they (typically) allow you to use coupons during their sales, which really help you rack up the savings. This means that, depending on the sale, you could save up to 83% off! All you have to do is answer 5 questions and you’ll get an email telling you how to save an extra 20% off your next purchase. It’s like having your own personal Macy’s sale day! So what are you waiting for? 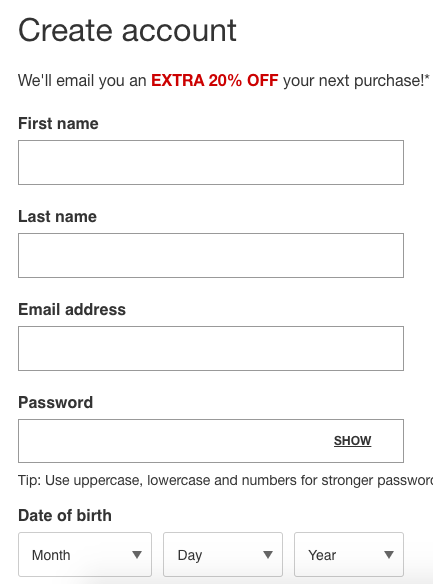 Create your Macy’s profile so that you can have that extra 20% off ready for when you need it most. Create your Macy’s profile now. Keep in mind, it may take several days to receive the email with your discount code. The discount cannot be combined with savings pass/coupon/extra discount/credit offer except opening new Macy’s account. The code is valid in-store for use any single day & one time on macys.com.